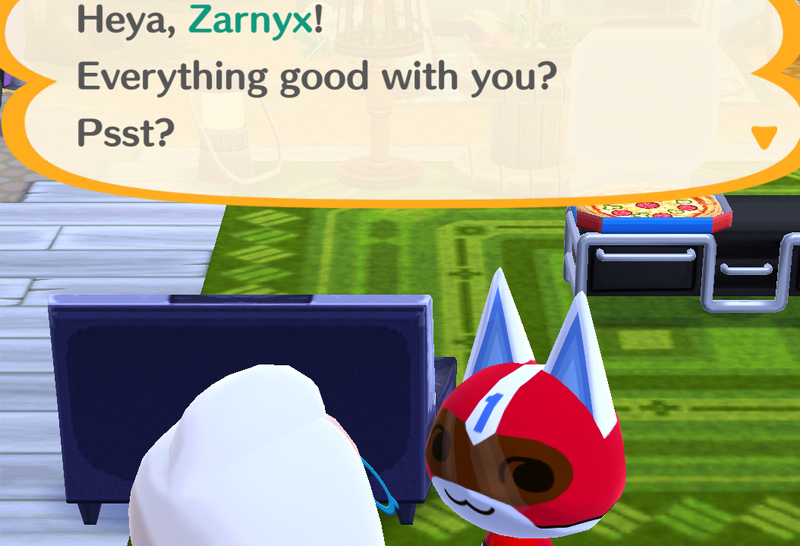 After luring Kid Kat, a superhero cat with a Speed Racer fashion sensibility, to my mess of a camping ground, I lost interest in Animal Crossing: Pocket Camp. I’d spent hours—sometimes portions of entire days—obsessively and painstakingly crafting furniture to satisfy animals’ requests. I just couldn’t do it anymore. It may sound as though Nintendo’s latest mobile venture isn’t that much different from the main game series it’s based on. But the truth about Pocket Camp, which released worldwide in late November, is that its devilishly cloaked as an Animal Crossing game without some of the series’ heart. Let’s start with the good. Some of your favorite neighbours are in Pocket Camp and will grace you with their silly conversations and nicknames. This is a staple of the Animal Crossing series and it’s great to see some of them here. Their personality types are reflected in their interactions with you. Unfortunately, it’s in a more limited capacity in Pocket Camp due to their purpose of being solely there to act as creatures that give requests in a very game-like, goal oriented manner. They come and go but aren’t intrusive and insane, unlike those wonderful neighbours who take up residence in the series who will often barge into your homes, and insert themselves into conversations with you and other NPCs. But they’re awesome for being so damned likable because they’re often so sassy. Animal Crossing has always had strong, well-written personable dialogue given to their animals, so it’s fantastic to see that here in Pocket Camp. To name only a few I’ve found so far: there’s the sweet Goldie dog, the gruff Butch (also a dog), the rock star penguin Tex, or my favorite Jay, the muscle-on-the-brain birdbrain with a penchant for calling me “Brosephine”. And this is, essentially, where the good part (and even the good is flawed as noted) of Pocket Camp ends. There are four main themes in Pocket Camp which are used to design specific camping showpieces that account for the aesthetic of your camping ground: cute, cool, sporty, and natural. Fulfilling requests and befriending the animals will net you ‘essence’ vials of these themes used as crafting material. A cute campsite would host a merry-go-round, for example. Running around doing errands for the animals helps build friendships. Players can fish, catch bugs, or shake trees for fruits to accomplish this. Building furniture upon request by animals will help convince them to stay at your camp. These actions are all a core part of a mainline Animal Crossing game but like the questionable concept of vials of ‘essence’ (seriously, what? where’s it coming from), the experience of Pocket Camp is simplified and distilled into something rather dull. Pocket Camp takes the basic functions of an Animal Crossing game and somehow manages to create chores out of chores. Let’s be real: in the Animal Crossing games you spend a lot of time doing chores. Whether it’s running around finding neighbours to deliver clothes, or gathering fruit to sell for money to pay off Nook’s housing loan, these are menial tasks that Animal Crossing successfully turns into a rhythmic, relaxed mind-clearing activity. Part of this is that the mainline Animal Crossing games allow players to do a lot more, and at their own convenience, which feels more rewarding. Rewards come by earning bells (cash) to decorate an ever-growing house from an expansive catalog. Or the reward is in the extended, hilarious conversations with brutal honesty which pour from favorite animals’ mouths. There’s danger in shaking trees in Animal Crossing for bees can attack in a densely forested land called home. There’s the thrill of feeling a line tugged at and the float sinking under the water by a fish, in addition to the sound cues which help to nab them through required patience and fast reflexes. In Pocket Camp, the emotion of it all is removed. Gone are the ultra stealthy movements on unsuspecting bugs and knowing when to strike for a victorious catch. There’s no sense of true interaction when catching that hard to attain bug or fish. No sense of accomplishment when a prompt comes on the screen merely asking players to tap. Tap! And it’s over. And yes, Pocket Camp is a mobile game designed for quick bursts of play and iotas of satisfaction with low-maintenance input from users. That’s the nature of the beast that are some mobile games. But for games as rich as the Animal Crossing series is—even though its concept is built upon enjoying the pleasures in the simplest actions in life—Pocket Camp feels soulless. The little details aren’t quite there. It acts like an Animal Crossing game in the changes of colours of the leaves. Some of the sounds, like opening up a menu, are familiar and comforting. It’s a joy being able to fish those icky favorite squids of mine or catch a treasure trove of pale chubs and yellow perches out of the river with a net (nice new trawling method there though, Pocket Camp, I’ll give you that). Once a day, a non-fruit tree can be shaken down for bells. 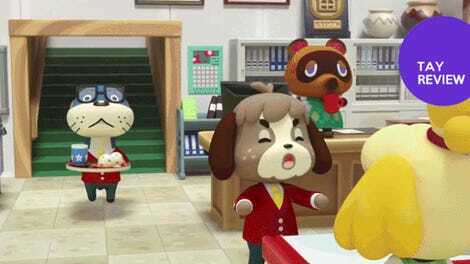 The animals are still ridiculous but only to an extent in that players’ interactions with them are not as involved as in mainline Animal Crossing games. Playing Pocket Camp, however, feels like there’s much less control over your own ideas in how to shape your camp. It’s, at the very least, how I felt playing in those initial hours and subsequent days. In order to get animals to stay at your camping ground, players are required to make specific items and furniture sets to the animals’ liking. In this way, Pocket Camp borrows an idea from the 2015 spin-off Happy Home Designer. In Happy Home Designer, players became interior (and exterior) designers. Animals would request a themed house design with an accompanying inventory of furniture players could choose from to work into a layout. It worked for that 2015 game because there was one large space to design for one particular animal, on a one-on-one project basis. This idea isn’t executed well in Pocket Camp. What ended up happening was that my camp looked like no thought and care went into designing it. It was a style disaster having to constantly rotate and mismatch sets in limited spaces just to get the animal I wanted. Limited space is by far Pocket Camp’s biggest setback. Expanding the camper itself is nice enough to personalize a space—something that’s key to Animal Crossing’s addictive, fun nature in home ownership—but it’s just not enough. I could spend more time in my camper but it doesn’t necessarily feel like a home even when outfitted with all my favorite furniture. Not when I don’t feel like spending any time there, really. The dynamic is different being supplanted in a spot surrounded by animals who can drop by with weird stories or ask for play dates as the Animal Crossing series is known to do. It feels more a community in that regard than Pocket Camp’s tiny curated space. Then there’s the wait time to build items. Some items take very little time, while others can take 9 hours and more. As a mobile game, Pocket Camp’s catch is to spend and buy (with real money if you’re desperate enough) leaf tickets which will complete tasks instantly. I’m not desperate enough for that. Animal Crossing games have always been about life happening no matter the time of day. Waiting has been a part of its DNA. Don’t like an item in the store? Check back tomorrow. Harvested all the fruit in town? Okay, there’ll be more tomorrow. But with so much to do at any given playtime, it never feels as horrible as it does as watching a timer whittle away the hours in Pocket Camp. The problem is that there really isn’t that much to do unless you’re willing to pay, and so, I’m ready to move on. At least I can still see Nach and watch him yawn at my achievements, just like old times. There’s something else, too. There’s something to booting up an Animal Crossing town, born of small beginnings and kickstarting it into something that grows and flourishes with initial planning and decisions on players’ parts. And then, with very low maintenance, blooming into something wonderful. It takes time but not on a tightly wound, tangible countdown clock as Pocket Camp does. Life in Animal Crossing moves even when you’re not playing. At any point you can just jump into the microcosm world that’s a more pleasant reflection of our own to see changes, both negative (when animals leave or weeds grow) and positively naturally flowing as life is wont to do. Its clock runs without your input. At some point, village life manages itself and yet the urge to visit isn’t tied to timing when an item is made. It’s tied to the simple rewards in just living—something Pocket Camp tries to micromanage and in doing so, loses its charm. The point isn’t lost on me that Pocket Camp is a downsized version of an Animal Crossing game. “Pocket” is in the name, after all (and it’s a really clever one at that). But for someone such as myself who has religiously played the series since its US release in 1999, Pocket Camp does just one thing: it makes me want a new mainline game for the Switch more than ever. I’ll give some credit to Pocket Camp and in the same breath, highlight the torture it brings. The new seasonal event that started up yesterday allows players to earn candy canes to craft holiday-themed furniture and be rewarded with festive clothes. It’s a sweet reminder on just how special the Animal Crossing games are in that they really delve into holidays and the joys that come with each season. But when rewards are labeled as stretch goals and boring back-and-forth tasks are required to earn any of it as they are in Pocket Camp, it’s just another upsetting instance of how routine and bland these activities become. Where’s the honest joy? It doesn’t exist here. The tease that is Pocket Camp is too much, and too uninspired for it to be a meaningful dive back into Animal Crossing’s world. The last proper entry was in 2013 with New Leaf, and Pocket Camp is a reminder that it’s been far too long since we got anything majorly great from the series. I understood Animal Crossing: amiibo Festival and took it for what it was. I even enjoyed it even though it was a stripped down, strange take on Animal Crossing trying to be a weird, sad version of Nintendo’s Mario Party series. Happy Home Designer was a wonder for showing just how all the technical details in designing a house space could be implemented in a future game. I need a new, real Animal Crossing game. Pocket Camp can be mindless fun and it gets some of the series right but ultimately, it just isn’t a worthy entry.